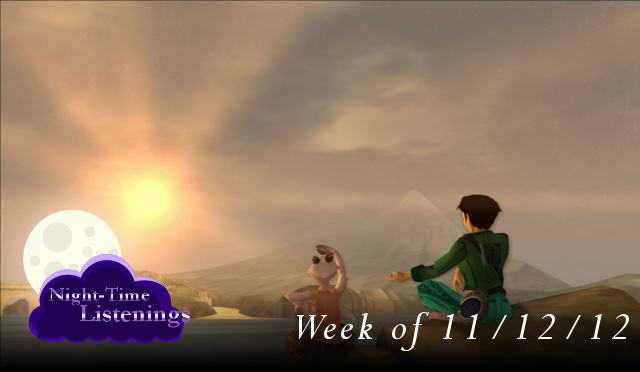 This week we took a stroll into the calm side of videogame music. We chatted with friends in Final Fantasy XI. Went to work at the refugee camp in Xenoblade. We soaked up the sun in Final Fantasy X. We took some photos in Beyond Good & Evil. And finally we woke up to a fine morning in Arni Village in Chrono Cross. This entry was posted in NightTime Listening and tagged Arni Village, Arni Village Home World, Besaid, Besaid Island, beyond good & evil, bgm, Christoph Heral, Chrono Cross, Colony 6, final fantasy, Final Fantasy X, Final fantasy XI, Home Sweet Home, Manami Kiyota, Mhaura, nobuo uematsu, ost, Refugee Camp, vgm, videogame music, xenoblade, yasunori mitsuda on November 17, 2012 by Steven T..